Tortilla Espanola roughly translates into Spanish omelet. It is one of the mainstays in my cooking repetoire. One can hardly go wrong with a dish that calls for potatoes and eggs! I am told that in Spain one can go to a bar and order drinks and the tapas are free. Tapas (or appetizers) can be a variety of things but frequently tortilla Espanola is on the menu. You may eat tortilla Espanola for breakfast or dinner or appetizers. In my home it is typically served with milanesa (breaded fried steak) and an avocado onion salad (previously posted on this site under recipes). 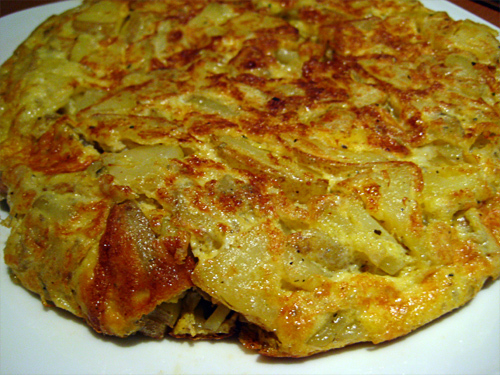 Tortilla Expanola can be served with lemon wedges, catsup, a tomato-onion-pepper sauce, mayonnaise, or eaten as it is. It can be eaten hot, room temperature, or even cold. Heat the oils in a 9-inch skillet and add the potato slices. Cook, turning occasionally, over medium heat for 5 minutes. Add the onions and garlic and cook until the potatoes are tender and golden brown. Drain oil into a container by holding a skillet lid to the edge so the potatoes don’t escape. I suggest having the container in the sink in case you spill some. You will have a bit of oil left at the bottom. Put the skillet back on the burner and spread the potatoes out evenly. Beat the eggs with the seasoning salt. Pour the egg mixture evenly over the potatoes. Lower the heat to medium and continue to cook, shaking the pan frequently, until mixture is half set. Use a plate to cover the skillet and invert the omelet away from the hand holding the plate. . Slide the omelet back into the skillet on its uncooked side. Cook until it is completely set. Now use a plate to cover the skillet and invert the omelet on it. It is ready to serve. Cut it into wedges. Note: I sometimes add chopped tomato to the egg mixture for variation. This entry was posted in Recipes and tagged easy recipe, potato omelet, recipe, recipe for, Spanish food, Spanish omelet, Tapas. Bookmark the permalink. I’m making something similar which we call “Farmer’s omelet” here in Norway. I add bacon or sausage slices, and use chopped chives, spring onions or leek, or all of them, instead of onions and garlic. I eat it with slices of bread.